Jock McOrist gave a talk in the String Theory Seminar at Oxford on 23 October, and at the String Theory Seminar at CEA/Saclay in Paris on 9 November. He is visiting Banff in Canada from 1-5 December for a String theory and Generalised Geometries workshop. 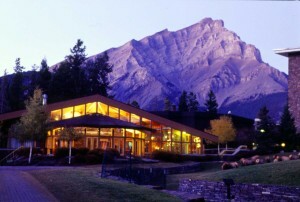 Banff by night is shown in the accompanying photo.